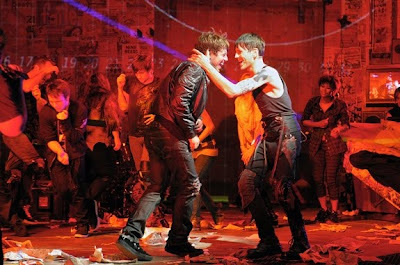 Gallagher brings the same passion to Johnny that he did to his Tony-winning performance as Moritz in Spring Awakening. With every guitar riff, his body and face convulse with an anger and defiance that no other actor currently brings to the stage. His vocals, equally equipped as his acting, are perfectly suited for Green Day’s score. Sands gives Tunny a piercing, bewildered stare, as he is first entranced into the armed forces, and then a hollowed-out gaze as he is wounded and lies in an infirmary. With few scenes to devote to his experience in Iraq, Sands fills the gaps of his incurred traumas with a broken presence. Esper gets the most underdeveloped character with Will, but sets the tone for the apathetic dad. Without much fuss, he turns Will’s couch into his prison of disinterest. Although more could have been devoted to this third of the trio, Esper shapes a sufficient character out of what little he is given. In the supporting cast, Tony Vincent gives perhaps the strongest performance in the company, playing Johnny’s demonic, drug-dealing alter ego. Devilishly good, Vincent slinks around the stage, the heroin-dolling, tattooed spirit to Johnny’s Ebenezer Scrooge. He boasts some of the strongest vocals in the cast, and his grotesque, emaciated appearance creates an outrageous, memorable character. Passing Strange’s beautiful and affecting Rebecca Naomi Jones is unfortunately underused as Johnny’s exotic love interest, Whatsername. Yet with spotlight moments with “21 Guns” and “Letterbomb,” she shines in all the right ways. This is probably the best show on Broadway to be an ensemble member (or is this one of the best new ensemble’s on Broadway?). Every company member is active on stage at all times. And these kids work for the money, risking broken bones and necks during every song. Mayer and choreographer Steven Hoggett push these performers to their limit, but it pays off in jaw-dropping ways. Leaping from platforms, dangling from the top of the stage, and flying on wires, the actors commit to every stunt and make it look as easy as in a video game. The wild acrobatics they’re forced to perform perfectly match the intense rock score they’re set to. The American Idiot cast stomps, kicks, and jerks their way all over the stage of the St. James, up and down, left and right. Never before have I seen a stage fully utilized, every square inch of it (and I’m talkin’ the air above it). Set designer Christine Jones has staircases, scaffolding, and windows scaling the towering set, which the actors tear up, climb over, and leap out of. And if the performers can’t climb it, they’ll just fly up. For the poetically staged number “Extraordinary Girl,” Mayer has Sands and Christina Sajous perform a high-flying act that’s better than any I’ve ever seen. Unlike most sequences, the actors don’t look inhibited by the wires. Just another aspect proving that if it’s in this show, the team has committed to doing it 100 percent. Illumination is one of the most prevalent facets of American Idiot, and it appears to be a perfect collaboration between set designer Jones, lighting designer Kevin Adams, and video/projection designer Darrel Maloney. The high walls of Jones’ set have flatscreen TVs of varying sizes embedded in them. Maloney’s video montages of news and entertainment clips flash on them, as do graphics of cartoon grenades and bleeding hearts. Jones’ concert poster-covered walls are light enough to allow Maloney’s vibrant projections to engulf the stage. During “Boulevard of Broken Dreams,” a twinkling city skyline pans behind Johnny as he sings, and during “Extraordinary Girl,” an EKG read becomes an incredibly vibrant backdrop to Tunny’s well-coordinated flight. Kevin Adams (noticeably missing his neon-bulb lighting that was so present in Spring Awakening, Passing Strange, and Next to Normal) makes plentiful use of floodlights in this production, bathing sections of the stage and walls in sharp greens and reds. The collaboration between Adams, Maloney, and Jones is evident throughout, as none of their areas drown out the other. Like the creative team, the actors converge tightly to build this efficient machine of a production (they kind of have to, or else someone would surely lose a limb). Mayer’s vision of American Idiot is portrayed so clearly, and it’s nothing short of astounding since he’s pushing the actors and technical features to their limits in this 90-minute roller coaster. Yet despite flying, leaping, and punk music that nearly blows out the speakers, Mayer sets the show’s tone with precision. At the musical’s opening, the curtain rises and a cacophony of sound bites and clips play on the television sets. As the cast gazes at the screens, President George W. Bush appears and delivers the chilling statement that we all heard so soon after the September 11 attacks, “Either you are with us, or with the terrorists.” I heard the words that frightened me back then and they still frightened me now. And BAM—I’m suddenly ready to take that ride with American Idiot. Editor’s note: I bought a ticket the old-fashioned way to American Idiot, although it does have a ticket lottery. Names can be entered two hours prior to the performance and winners are drawn a half hour later. Two tickets per person for $27. Seats are located in the first and second rows of the orchestra. I'm so glad I could have experienced this show with you, Jess! What an amazing experience it was! Props to cast AND creative team for a really great experience…one I'd like to revisit! I am so glad I found this website!! I am definitely a rusher ! I just moved to NY and have fallen in love with theatre! Nobody at my workplace understands ! 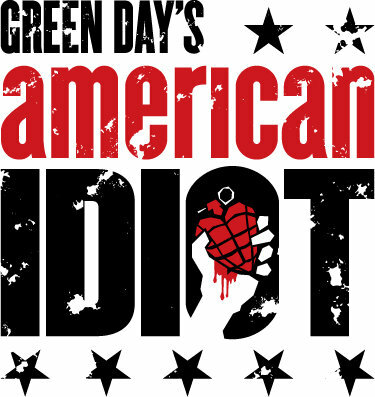 I have read every review of American Idiot that I can find, both professional and blogged. I really enjoyed your appreciation for all the technical and creative accomplishments of this show. Your well written, insightful commentary insures that I will be checking in here for future reviews! Thank you. @Kym: Yes, so glad we got to experience it together too! I would definitely like to see it again, this time from a difference perspective. @kokostiletto: Thank you so much! Hearing you enjoy it is the best thing I can hear. Please come back! @Anonymous: Thank you so much! I am so glad that you felt a connection with what I felt about the production. Thanks for taking the time to comment, and please check back! This show is so great. There is so much to look at going on, I need to see it a few more times! @Carlos: Yes, it's definitely one to see numerous times to catch everything. There are so many visual details to catch. I know I didn't see them all (particularly because of where I was sitting).